Welcome to Bruce’s Billiards & Beyond! 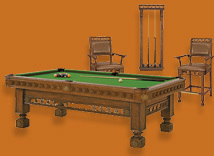 We carry the finest quality Billiard and Game Tables, Game Room Furniture, Gaming Décor, and Accessories on Delmarva. We invite you to come to our showroom where we have a wide selection of new and used pool tables and accessories for you to choose from. You will be received into our store with knowledgeable and friendly service. We’ve been in business and serving the Delmarva community for more than 35 years. Come on in and take a look around. Whether you already know what you want, exploring your options, or just plain lookin’ around, we look forward to meeting you. While we have a large selection on hand in our Salisbury showroom. We work with the best manufacturers in the business to bring you anything you could ask for in gaming tables, furniture, and accessories. Check out our Pool Tables, The Game Room, and Accessories sections on our website. You will find samples in each category where you will find a full array of the finest equipment on Maryland's Eastern Shore.